Two weeks ago I started trying out podcasts seriously for the first time. So far I mainly tried the ones from a German news radio station (http://www.dradio.de/podcast/). I downloaded the audio files about topics I found interesting and listened to them while traveling to and from work. I really enjoyed it – especially because of the facts that I could now listen to talks and reports I am really interested in and I didn’t had to pay attention to when they are broadcasted. However I found it quite cumbersome to navigate through the radio station’s web page, to select each podcast separately, to download them and finally to transfer them to my neat Samsung T9. So I started looking for some tools that could simplify this process. 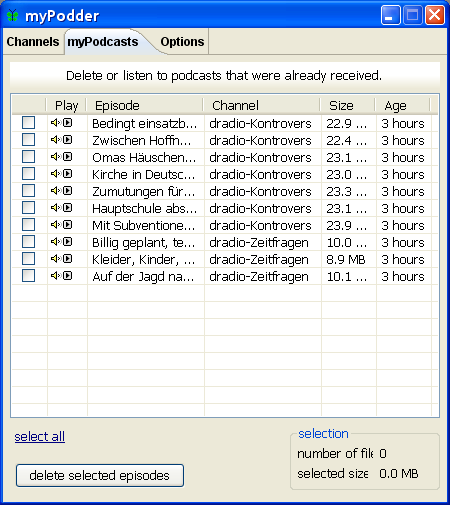 I finally came across a handy software called myPodder provided for free by Podcast Ready. 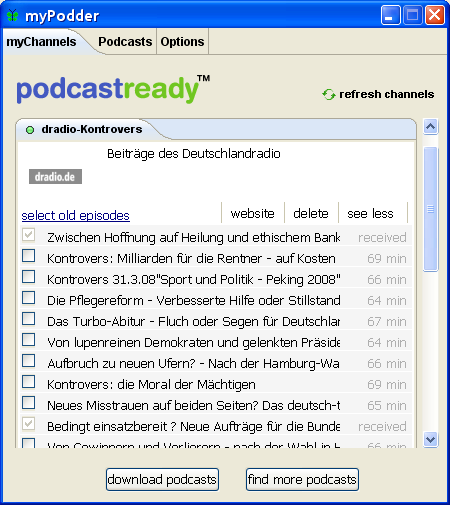 Podcast Ready provides an online catalog of available podcasts from different sources and to my surprise they also have that German radio station listed. The interesting thing about their software is the fact that you can directly install it onto your mobile audio player and have it launched automatically the moment it is connected to a computer. This means you can easily charge your player with new podcasts from any computer having an internet connection. Simply connect the player, wait for the program to launch, select some new podcasts and download them.